The year started with a bang as both US and international stock markets roared ahead in the first quarter. Bonds were much more muted as investors grappled with the potential upward nudging of rates by the Fed. As we pass the eighth anniversary of the turning of the markets and economy it is useful to look back and think about just how far we’ve come over that time. Things were looking pretty grim back in the spring of 2009 and almost all of us had been scarred in one way or another by the significant downturn in the economy that some call the Great Recession. On the business front some pretty big names had simply disappeared, tipped over into liquidation by that tumultuous series of events and families across the country were struggling to hold onto their jobs and their homes. Fast forward to today and things look a lot different. We have reached “full employment” and rather than a surplus of folks looking for work we now have many positions being unfilled. Businesses are healthy, the economy is chugging along and the stock market is breaking new records as corporate earnings move upwards and as investors increasingly feel comfortable with paying more for a dollar of earnings that they did a year or so ago. It is an interesting time for certain. The change in the political landscape has been significant and markets and businesses have responded, seeing the potential for growth in the economy seemingly enhanced by the promise of lower taxes and less regulation. We’ve seen this most directly in the action of the stock market whose advance since the election has been robust but anecdotally we hear of businesses beginning to put capital to work and laying the plans for future expansion. It’s important to remember that capital markets (stock, bond and other) look ahead and incorporate assumptions about what the world might look like 6 months or a year hence into the price movements of today. That market rise last quarter isn’t about what is so much as what will (or could) be. Should that vision of the future not turn out quite the way it might be expected to, then adjustments will be made in outlooks and be incorporated into the market levels of tomorrow. Over the long term, of course, stock prices are based on economic growth, the level of interest rates (as they set the bar for investment alternatives to stocks) and current market valuations, i.e. what investors are willing to pay for a dollar of current or future earnings. That last factor is a key one, and one that we employ regularly when looking at the relative attractiveness of the various components of your portfolio. Absolute valuations for the market as a whole (for instance “the market is too high”) are quite hard to make meaningful judgments about in the near and intermediate term as markets that are getting a bit pricey may continue to do so for some time and vice versa! We can however use relative valuations to see which segments of the market are starting to overheat or look very attractively priced and we review these data points on a continual basis as we think about constructive changes in your portfolio. Over the last several months we’ve made a few changes based on valuation. The stocks of small and medium sized companies have appreciated substantially over the last 12 months or so, making them more expensive, so we trimmed back on those positions and redeployed those dollars into more conservative larger stocks. 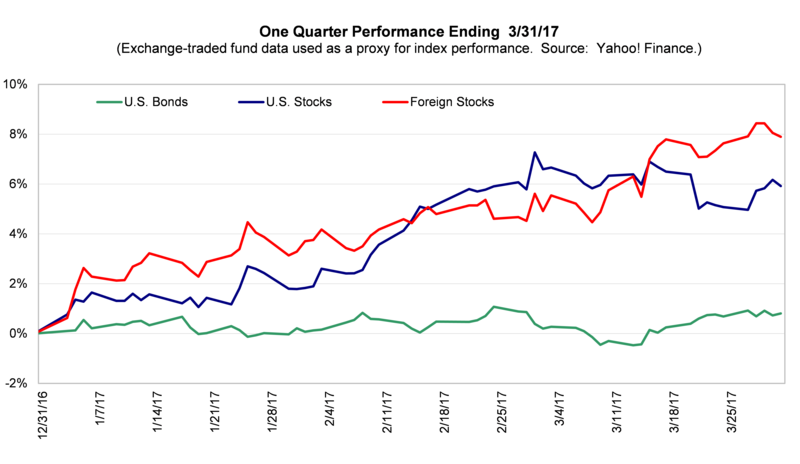 We also continued the process of paring back on high yield bonds in the portfolio, redeploying those dollars into floating rate securities with greater interest rate risk protection. This decision was also based in large measure on valuation as those high yield bonds, which have long given substantial returns, are now priced at the upper range of their spectrum vis a vis higher quality debt. Looking forward, markets will continue to be influenced by a number of economic factors. Corporate earnings are key of course and the direction of the economy is perhaps the major contributing factor to successful growing companies and to jobs and opportunities in communities throughout the country. So far so good on that score, we’re seeing continued economic growth coupled with low unemployment and the Conference Board’s leading economic indicators continue to point in the right direction. Interest rate increases, which folks expect more of this year, can have a moderating influence on markets in a number of ways but a measured pace of increases is not terribly worrisome as they reinforce the notion of strength in the broader economy. A significant difference over time in rates will also wiggle itself into the valuation equation however, which brings us back to, you guessed it, valuations! As we talked about earlier, trying to judge the valuation of the market as a whole is very difficult save perhaps in those times when valuations are near extremes of their range (think May of 2000 on the upper end and March of 2009 on the other end). Valuations have been creeping up over the last 8 years and we’re higher now than average certainly but perhaps not in the nosebleed territory as yet. These higher metrics could certainly provide, coupled with some other sort of economic uncertainty, an excuse though for the next market correction but that is just as it should be as market corrections do happen fairly frequently and their effects are naturally mitigated to some degree by our overall portfolio diversification. In the meantime it’s spring, the days are longer and, thankfully, our televisions and computers have an “off” switch we can use to moderate the barrage of political and financial news that can be so unsettling at times. It’s the economy that will be the prime driver of the markets and the political parties have a lot less to do with that than one might be led to believe.